From right to left: UCSB students Yxenia Contreras, Emma Olin, Allyson Gaarder and Leila Youssefi; Matt St. Clair, director of sustainability for the UC Office of the President; UCSB students Paulina Pevzner, Daniele Burns and Claire Knowles; and Mark Rousseau, energy and environmental manager with UCSB Housing & Residential Services. St. Clair presented the award to UCSB's winning Power Save team. 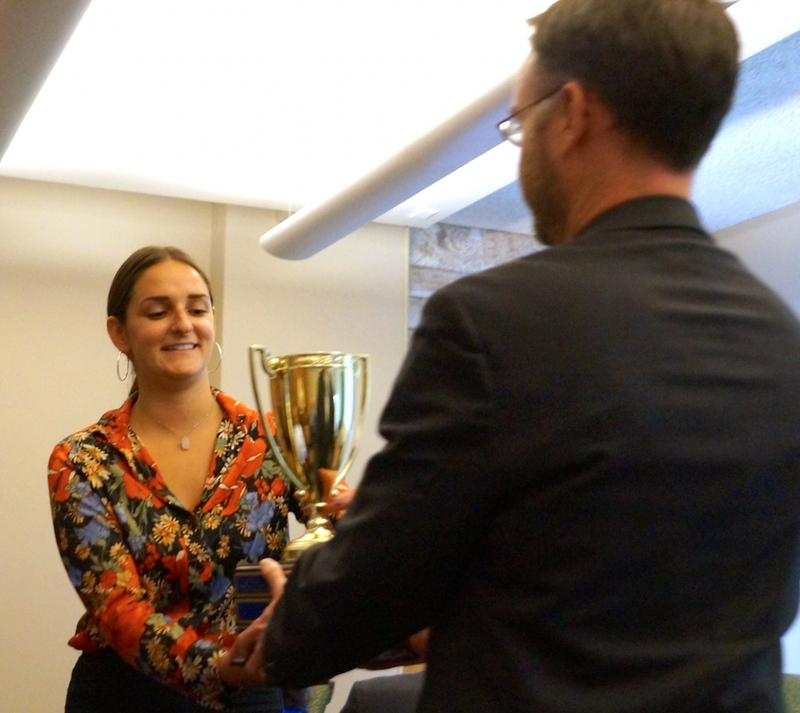 UCSB student and Power Save team member Paulina Pevzner receives the trophy for the systemwide conservation contest from Matt St. Clair, director of sustainability for the UC Office of the President. Spurred on by the slogan “Gauchos Do It in the Dark,” the occupants of eight residence halls at UC Santa Barbara teamed up to cut their combined electricity use by nearly 8 percent during a Feb. 16-March 8 systemwide friendly competition, inching ahead of other University of California undergraduate campuses. 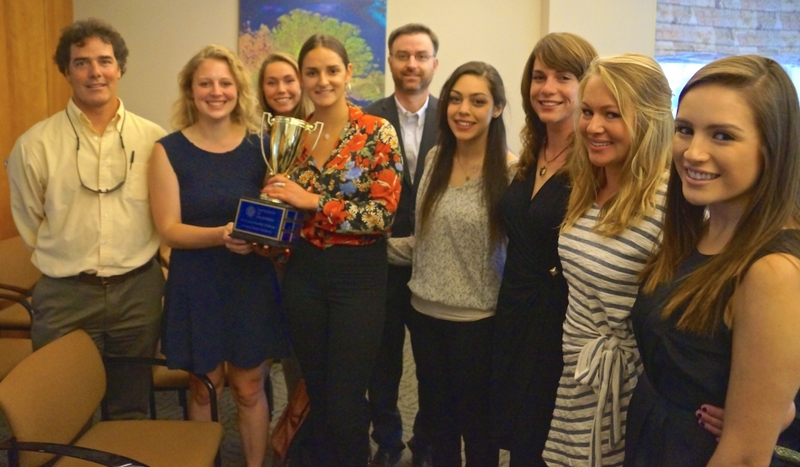 Launched by the UC Carbon Neutrality Group, the contest marked the first time that all UC campuses participated in the Campus Conservation Nationals, which challenges students, faculty and staff at 186 university campuses to reduce energy and water use. Participating in the contest is part of an effort to engage more students in UC President Janet Napolitano’s Carbon Neutrality Initiative, which commits the UC system to produce zero-net greenhouse gas emissions by 2025. The “Gauchos Do It in the Dark” catchphrase — and a giveaway of tank tops emblazoned with the slogan — helped spread the word among students who may not otherwise have participated, said Emma Olin, one of UCSB's student organizers in the competition. Coordinating outreach efforts with campus housing and residence hall advisers was key to increasing participation, along with the catchy name, she said. “Our branding definitely sticks out in people’s minds,” Olin said. In all, the competition helped UC campuses save more than 95,000 kilowatt-hours of electricity during the contest period. That equals a cost-savings of nearly $12,400 and reduced the amount of carbon dioxide in the atmosphere by 66,700 pounds. UC Santa Barbara’s name will be engraved on a trophy that it will host as the winner of the UC competition. Campuses that win future contests will have their name engraved on the trophy and will host it during its reign as champion. The winner of the overall Campus Conservation National will be announced on May 8. Competing campuses were scored based on highest percentage reduction in energy used by buildings during the competition. The data was recorded via a dashboard and website provided by contest co-organizer Lucid Design Group and compared with a baseline set in January. The competition is all about imparting long-term conservation habits and building awareness of sustainability and environmental stewardship. Some of these habits include turning off lights in empty rooms, shutting down idle computers, unplugging unused appliances, taking stairs instead of the elevator and putting on a sweater instead of turning on the heater. In most cases, student organizers at UC campuses took a light-hearted approach to promote the contest. At UC Merced, residence hall dwellers also were urged to “Do It in the Dark.” To get students’ attention, contest organizers put on an evening table display of lights highlighting the efficiency difference between LED, compact fluorescent and incandescent bulbs. During the first week of the competition, electricity use rose. But when the light bulb outreach display was set up the next week near the 13 competing residence halls, conservation surged by 6 percent, according Gabriel Morabe, a student coordinator of the UC Merced contest. Residents of Merced's Tenaya Hall, the dorm that saved the most energy during the contest, will be treated to prize giveaways at a Glow Fest party lit by glow sticks and glow-in-the-dark balloons to celebrate their accomplishment. Passion for environmental stewardship by UC students is nothing new: They are always a key part of UC’s sustainability leadership. Students pushed for the university's systemwide Policy on Sustainable Practices, enacted in 2004, which has helped make UC campuses among the greenest in the nation. UC President Janet Napolitano has made sustainability one of the top priorities of her administration, spurring UC even further by establishing a 2025 deadline for the system to be carbon neutral.